In a match that could be one for the ages, ROH World Tag Team Champions SoCal Uncensored (Frankie Kazarian and Scorpio Sky) literally will put their titles up for grabs in a Ladder War against the two greatest tag teams in ROH history -- Jay and Mark Briscoe and The Young Bucks (Matt and Nick Jackson). SoCal Uncensored (Frankie Kazarian and Scorpio Sky) turned the tag team division on its ear recently when they won the ROH World Tag Team Titles from Jay and Mark Briscoes in a Triple Threat Match that also involved The Young Bucks (Matt and Nick Jackson). 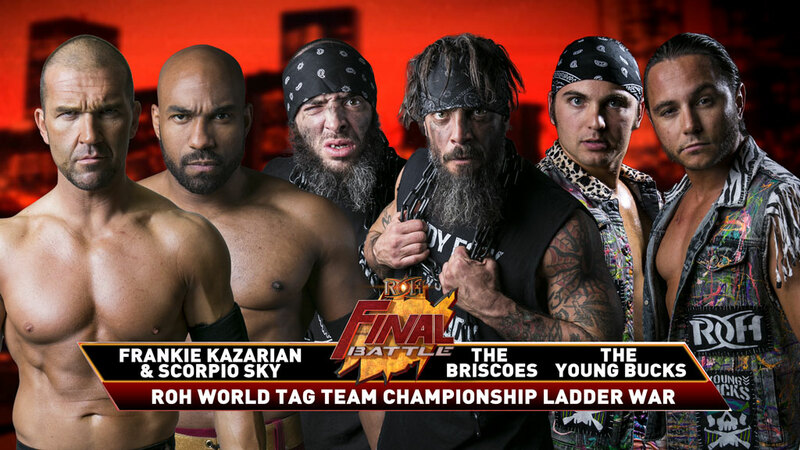 The result was considered an upset since the Briscoes and Young Bucks have 12 ROH World Tag Team Title reigns between them and are widely regarded as the two best teams in the business today, while Kazarian and Sky don’t often team together in traditional tag matches. Kazarian and fellow SCU member Christopher Daniels are two-time former ROH World Tag Team Champions, but Kazarian and Sky usually only teamed together in six-man tag matches. Sky replaced Daniels in the match because Daniels was unable to compete after being on the receiving end of a Jay Driller on the stage from Jay Briscoe a week prior. Kazarian and Sky’s victory created an unexpected twist in regard to the future of Kazarian and Daniels in ROH. At the beginning of the year, ROH COO Joe Koff put Kazarian and Daniels on notice that he was letting their contracts expire after Final Battle this December due to their repeated deplorable behavior. The veteran duo knew they needed gold around their waists for leverage, so they targeted the Briscoes’ titles. But now Kazarian is a champion, and Daniels is not. Kazarian and Daniels have changed their ways and have been trying to earn back Koff’s trust. After SCU won the tag titles, Koff rewarded Kazarian and Sky with new contracts, but Daniels’ future in ROH remains in jeopardy. 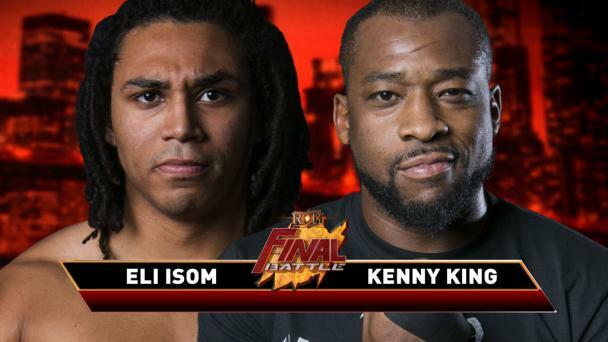 To determine SCU’s challengers at Final Battle, a match between the Briscoes and Young Bucks took place on the most recent episode of “Ring of Honor Wrestling.” Instead of a No. 1 contender emerging, however, the showdown ended in a double disqualification due to both teams using chairs as weapons. Kazarian and Sky came to the stage after the match and said they would defend their titles against both teams at Final Battle, but it wouldn’t be an ordinary Triple Threat Match -- it would be a Ladder War! Kazarian is no stranger to being in a Ladder War with The Young Backs. He and Daniels were the defending champions at All Star Extravaganza VIII, where they were defeated by the Bucks in a Ladder War that also involved The Motor City Machine Guns. It was voted 2016’s Match of the Year and has been called one of the greatest ladder matches of all time. The Young Bucks won their second Ladder War at Supercard of Honor in 2017, when they defeated Matt and Jeff Hardy to become three-time ROH World Tag Team Champions. That bout also was voted Match of the Year. The Briscoes have experience in Ladder Wars as well. They’ve competed in two of them, including the first one, which took place in 2007 and saw them defeat Kevin Steen and El Generico. With the richest prizes in tag team wrestling on the line and all three teams willing to risk life and limb to capture them, this very well could be the Ladder War to end all Ladder Wars.